I’m of mixed Scottish and English ancestry. My mother was born and bred on the Isle of Skye and would probably have stayed there if the Second World War hadn’t intervened. She met my father who was a naval officer from Kent. They married and settled in the south of England where I was raised. I studied history at Oxford University in the late 1960s when the approach to the subject was Anglocentric. The Celtic neighbours were bit players who only featured when they were revolting against the English. 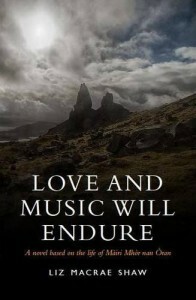 However as a counterbalance I spent every summer holiday of my childhood and teenage years with my grandparents in Skye where the music and culture seeped into my consciousness. I enjoyed two satisfying careers in England. Firstly as a history lecturer in a Further Education College and secondly as a counsellor and therapist. I feel very fortunate to be living in Skye permanently now with my osteopath husband and two standard poodles.